The Kingdom of Nords. The second of the two great northern kingdoms, the Kingdom of Nords have a great position to be the greatest faction. The second faction to be mostly based on infantry, the Nords have the best infantry in the entire game, making them a great foe towards the other factions. 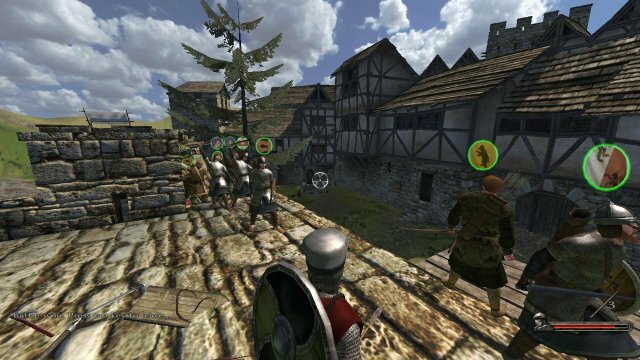 Infantry so strong to take over castles and towns without any trouble, however, out in the field, Nord armies are at the mercy of Cavlary from most of the other factions, except the Rhodoks. 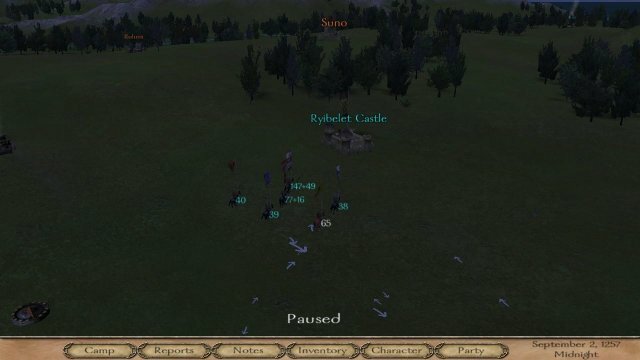 The Nords have good archers, the best infantry in the entire game however, lack the ability to have thier own cavlary force. 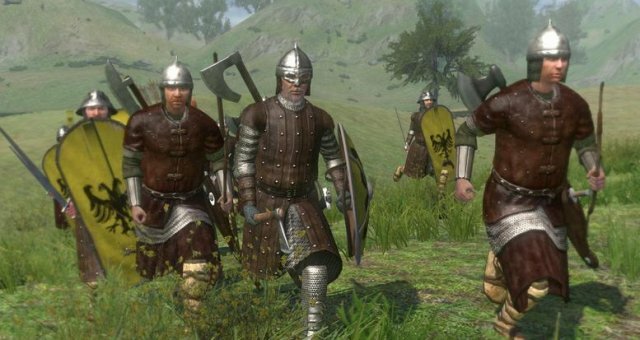 This guide is going to run through the Kingdom of Nords and how to beat all of the other factions in Mount and Blade Warband. Basic and Improved Infantry Melee. Welcome to the Kingdom of Nords Guide. The Kingdom of Nords are located in the northern part of Calradia. Swadia is directly south and to the east is the Vaegirs and Khergits. 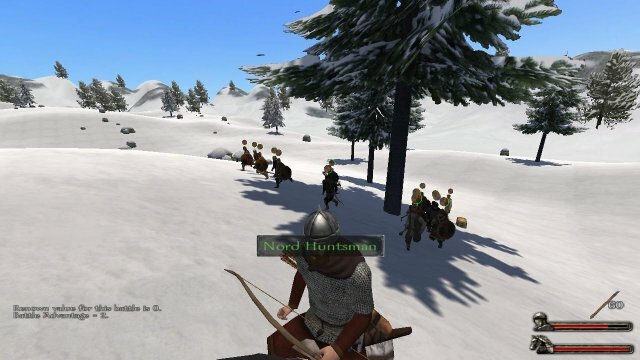 The Nords have the best infantry in the game, so thier armies are similar to ones of the Rhodoks, except replace crossbows with archers and you get the Nord armies. Like the Rhodoks, the Nords are good at taking castles and towns, however, lack cavalry to use on the actual battlefield. Now I am not saying that having horsemen is everything in Warband, but it just stinks to have suffer through constant cavalry charges from Swadia, Vaegires, Sarranids and the Khergits. Not going to lie, but in my Swadia playthrough, I was cutting through Nord armies like they were not even anything at all. 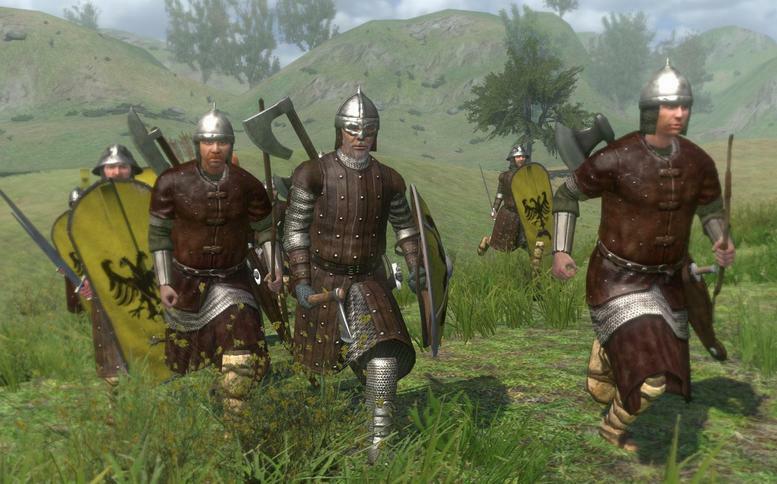 My point bieng is that the Nords have good armies, but I wish that the AI Nord lords would hire mercenary Cavalry, just to even the playing field. Let's get on with the guide! This singleplayer playthrough has been really intersting so far. For one, I have never really played as the Nords at all and second, I actually feel like I am winning at Warband. Now, for the most part, Sea Raiders have been my own and only way to fight. The one thing that has been a pain so far is that I have to travel far to get recruits, so I get a bunch at a time, but then I will also loose a bunch when I end up fighting a larger Sea Raider battle. My character, Rylin, is a horsemen/archery type character. Sure I have a short sword, but the bow is my main weapon. I have only been to a few towns. I mostly do my fighting on the coast near Rivacheg. Then I head back to Wercheg to sell my loot and then gather recruits from the surrounding villages surrounding Wercheg. Then I basically rise and repeat, getting money to buy food and pay my soldiers every week. I also havent leveled up as fast as I want to with this character, mostly because of the type of start that I wanted, but that is mostly my own fault. 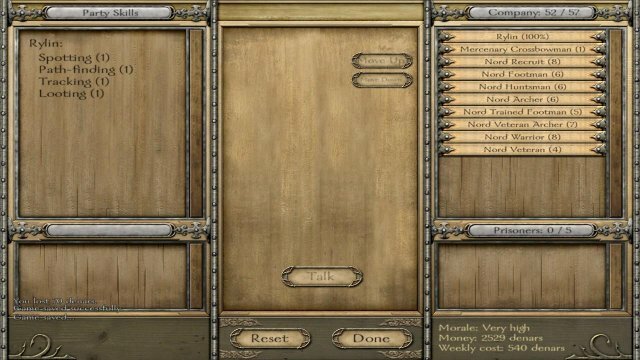 Since when I am techinically a commoner, it will take me awhile to get vassalge, which is what I actually want to do in this playthrough. I want to be a lord, own a village and make a really good Nord based army. Now unlike the AI, to even things out, I will end up hiring mercenary cavalry to deal with the other factions just in case I do end up going to war with those types of factions. However, at th emoment I have a few cavalry units that are low tier and I dont need a large force of horsemen with me just yet. I still have to level up and train up my infantry, which is the core of my army. I also have a decent amount of archers that support my infantry in battle. 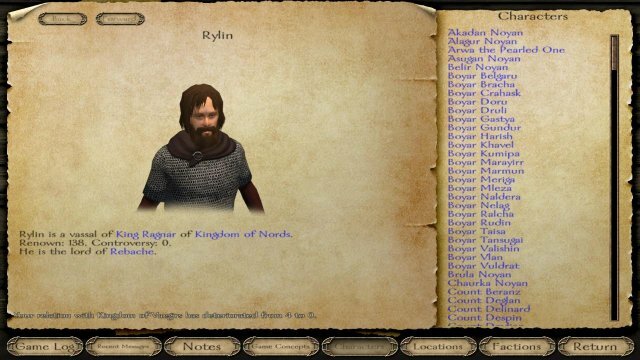 To increase my income, I ended up becoming a mercenary for the Kingdom of Nords, which means that I can join the Nords in fighting other factions, while getting paid a little bit from King Ragnar. This will help me in becoming a vassal later on. I spent mostly training up army. It has been very difficult to level up because my troops have been becoming stronger, leaving me with little or no time to move in and kill any Sea Raiders. I have not attacked their hideout, as to try to get more of them to spawn so that my army can fight them. I have been getting a lot of archers and infantry. I do not plan on focusing on getting any cavalry just yet, as I want to have a lot more money for that. I have leveled up a couple of times, which is good for my character Rylin. I have found that it is difficult to play as a horse based character, but it has been a great experience so far. My income is enough to keep my army floating, but I need more and more. I am planning on investing in businesses, but I only want them in Nord controlled Towns, so that I will still get income. This will eventually happen, as it is a long term plan and I will need to be close to becoming a vassal in order to do that. The only short term things that I can do is farm both Sea Raiders and Tundra Bandits, while doing other quests and tournaments. This is all part of the gridy and rising part of the adventure. I eventually came across some Tundra Bandits and defeated them easily. 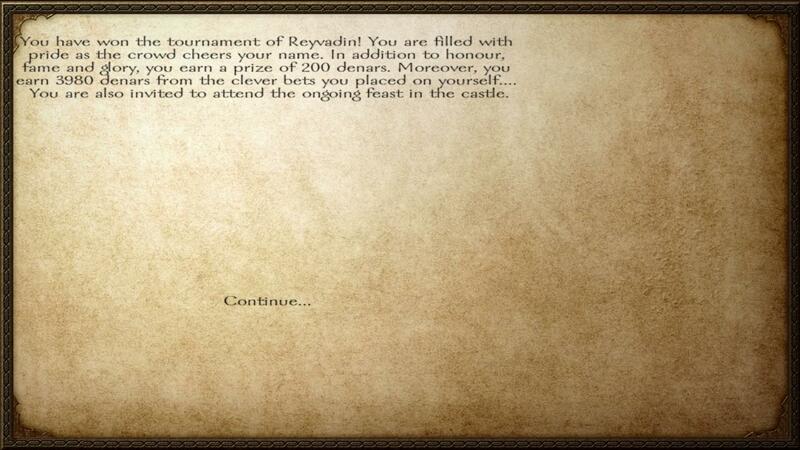 When I came to Reyvadin, they were having a tournament. I sold everything in my inventory from the battle and places bets on myself so that if I won, I would get a lot of money in return. I won the tournament and came out with over 7 thousand denars, which is really good. I also did some quests to improve my relationship with King Ragnar, because he believes that I would not be a great vassal at the moment. I did some more quests and farmed so more bandits for the time being. The first war that happened was with the Vaegirs. It was a very long war and I had to constantly be moving and fighting to keep my army afloat. I ended up raiding two villages and got enough money to invest in my first business, which was a weavery and dyeworks, which I put in the city of Tihr. Shortly after the war was over, I was finally able to become a vassal. 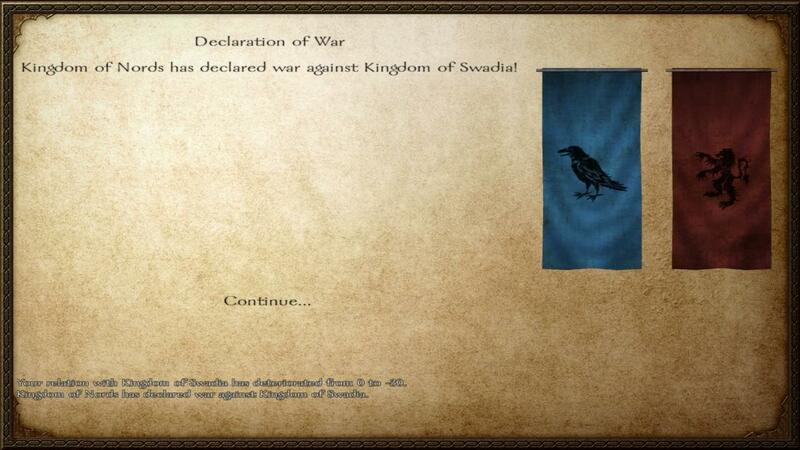 This happened after the peace was declared and I ended up helping a Vaegir lord against 130 Sea Raiders. My army was battered in the fight, but at least it gave me enough renown to actually become a vassal. 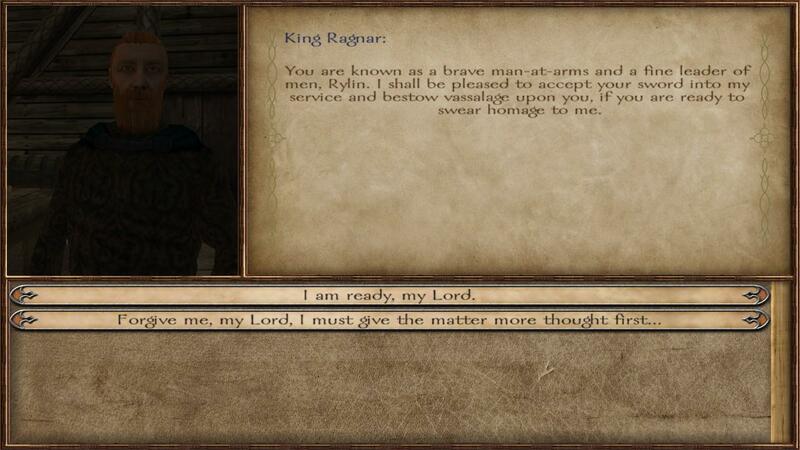 My relationship with the Vaegir lord improved and I never saw him again. I then got to Sargoth and became a vassal of the Nords. There was peace for a short time, until the Nords declared war on the Kingdom of Swadia. I know that this is going to be hard to deal with because of their cavlary, but I have confidence that we can win in the war. I only need 5 thousand more denars until I can open up a second weavery and dyeworks. If I can invest in businesses and collect rent from my village of Rebache, then I can use the money to pay my army and get some better weapons for my character. During the war, the Nords took both Praven and Dhirim. I also raided a couple of villages and had enoough denars to open up another weavary and dyeworks in Wercheg. I was in the siege of Praven and I ended up getting knocked out towards the end of it, but the Nords still won the fight. It is easier for the Nords to win because Swadia is being double teamed by the Vaegirs as well, so another war with the Vaegirs is possible. Then after the Nords took Praven, in the Seige of Praven, where I actually took part in, the Rhodoks declared war on us. 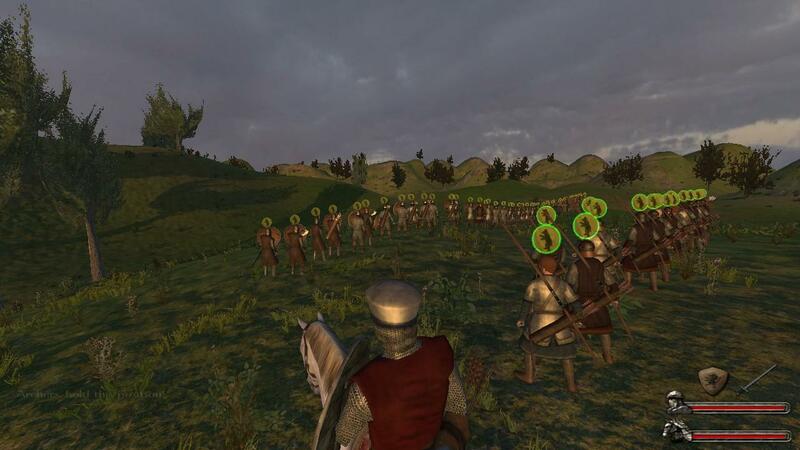 I moved my army towards the front and raided two villages belonging to the Rhodoks. This gave me enough money to build another weavery and dyeworks in Curaw. 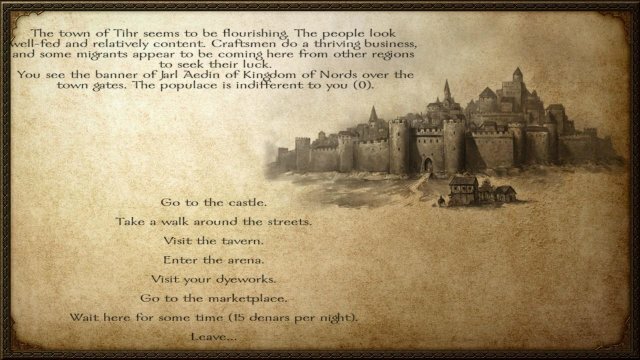 The only town that I have yet to expand my businesses is Sargoth, but I need a better relationship with King Ragnar in order to do that. While I was heading back towards the front, I encountered a Rhodok Lord, who was trying to not only raid a nearby village, but also trying to destory another Nordic Lord. I hopped into battle and eventually, we won the battle. In the process, I not only saved the Nordic Lord, but I freed another one as well. As for the Rhodok Lords, I let them both go and gained honor from letting them go in battle. Praven has been a back and forth town. Shortly after we took it, the Rhodoks took it, but we came back and retook the town, along with retaking the nearby castle of Ryibelet. 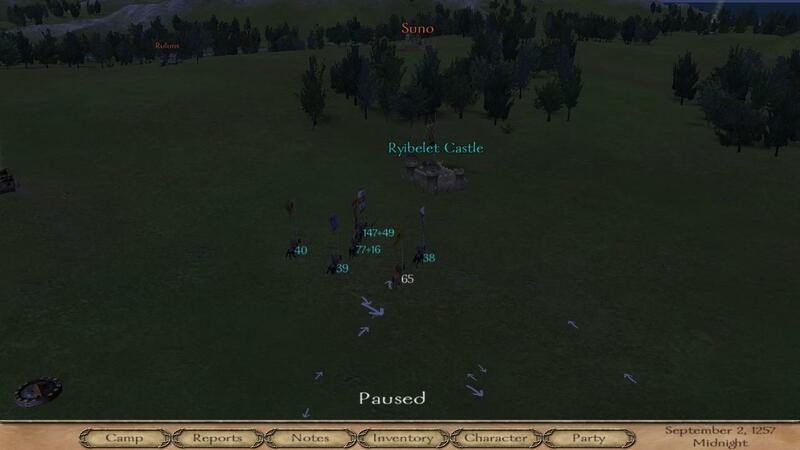 After the battle at Ryibelet Castle, the Rhodoks and Nords made peace, but we were still at war with Swadia, which was fighting really hard against us, even though that they are now the smallest of all the factions left. I went back up north and fought a couple Sea Raider parties to get some more income for my army. 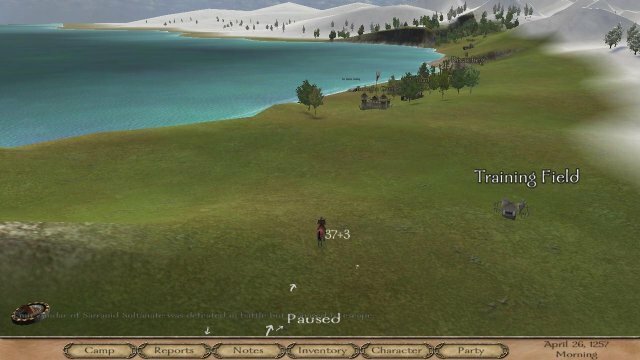 I then moved back towards the front, which is near the Praven area, and raided some villages and helped out smaller Nordic lords fight the Swadian lords. The Swadians tried to retake Praven, but it epically failed when the entire Nordic army showed up. I then checked to see if I was able to set up another weavery and dyeworks at Praven and I got the ok to set up one, which will be really good for me. My army is increasing in size and in skill, so it is costing me more and more to fund my army. Thankfully, I have been getting money every week instead of losing money. As long as I have enough money to pay for my troops, I can continue to fight the Swadains in the war. I have also been continuing to let go lords after I beat them in battle, as to gain honor. 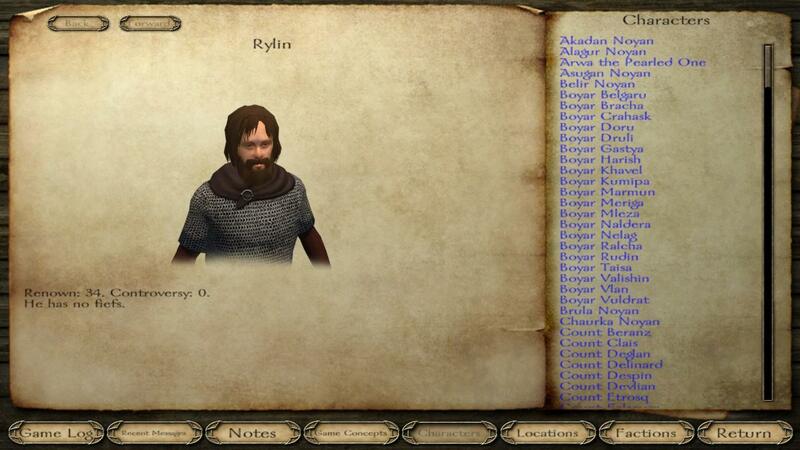 I even fought King Harlaus of Swadia, but he escaped from the battle. 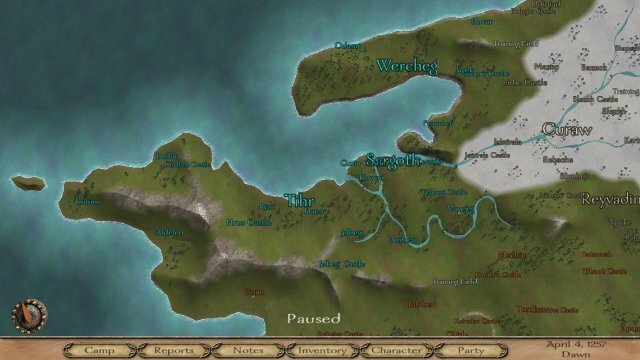 If the Nords can take out Suno, the last Swadian town, then Swadia will be basically destroyed. I am still fearing a war with the Vaegirs because they have a lot of land that is close to us. 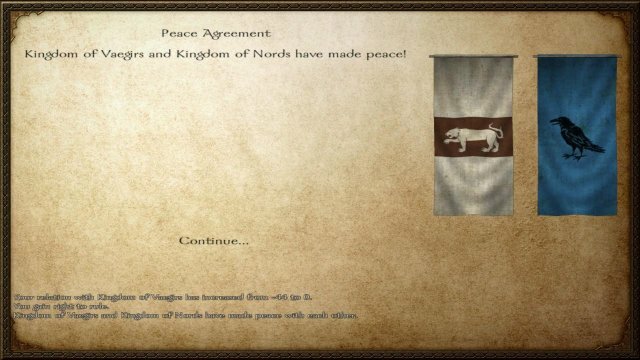 Finally, after a long fought war, the Nords and Swadians have made peace. It was not easy fighting them, but I can say that I was able to beat them without the usage of cavalry. It can be done and it was a great experience playing as the Nords. I thought that I was going to need cavalry but with only me as the single horsemen, I was able to defeat most of the Swadian cavalry by myself, without any help. We are at peace for now and there is nothing left to do until another war comes around. I can only just farm Sea Raiders and invest in other businesses. I don't want to get too carried away, because if I invest in a business and the Nords declare war on that faction, I won't get any of the money from it. With four businesses and a village, I can keep my army afloat and pay them without having to constantly fight Sea Raiders and lords of other factons all the time.